Can one be furious, and still write? I don’t know… so I thought I’d try… I won’t tell you why I’m furious, you folks know all about fury, and can surely share some of your own challenges. I can’t write when I’m in a rage, I can’t do anything but rage. I’ve heard people say that sometimes, the most spiritual thing I did today was to make my bed, and tidy up the apartment a bit before leaving the house. Buddhists will suggest to “Chop wood, and carry water”. So instead, I thought I’d try writing; I’ve started this blog to improve my writing, my thinking, and (wink wink! ): to get your attention. In the Zen Buddhist tradition, some people say that the quality of your “practice” is defined by your ability, or willingness to practice during the most unacceptable states of mind… Fury would qualify, innit? 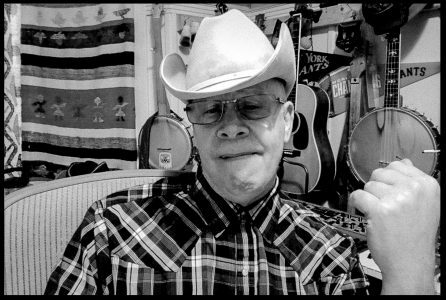 I’m a musician; I play guitar, and the 5-String banjo. 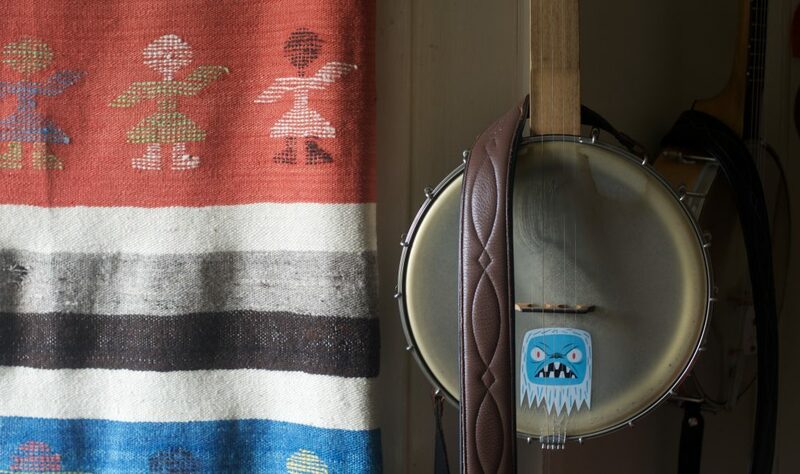 When I’m working on a phrase, or a lick, I can’t succeed with the motto, “I will now play as good as Mike Seeger….” I succeed when I pick up the banjo, and tune it up, take a breath, and start playing. I succeed when I stop, and notice that I’m playing a new phrase too swiftly, and that it’s good to try playing it say, half as fast. Surrendering to the process isn’t quite the most accurate word I’d use. But when I can move into the little steps mode, I know I’ll have a better chance of doing something other than grinding my teeth, or frowning like some horrible Japanese theatrical character. Part of the attraction to being furious is being right; or more precisely, wanting to be right… and that’s an awful burden…but when my eyeballs are popping out of my head from too much adrenaline, it’s pretty hard to see that… (note: Instead of doing something regrettable, or shameful- that is to say, I haven’t smashed anything, or sent off a nasty email- I’ve, so far, put 323 words down on “paper”… success!). I’ve been living one floor above Jim for over 28 years. That’s a long time in this city. I’ve known for decades the sound of his old wall phone ringing at odd hours- hearing him pound steak for one of his favorite meals… hearing him cough during the night… snoring… you live this close in an old building like mine, you’ll hear everything… our proximity has brought such intimacy… showering, laughing, singing…These things, and much more we shared- but always at a distance. Especially, and mostly, we shared silence. Jim was a quiet man… he kept to himself… he was always polite, but to engage him, I’d have to push a little. Over the years, I wondered if, perhaps, I’d tried too often, or too much. But more recently, I’d felt like we had found a reasonable common ground for fellowship. Just last week, I was disturbed by a succession of random buzzings from our ancient doorbell system. Most all of the 12 units in the building were called upon. No intercoms here folks, and no video, anytime you choose to “ring” someone into the building, you risk letting anyone in. These doorbell shouts, always an annoyance, continued. As do many other folks in our building, at certain times of the day one just ignores them. It could be anybody…but it was different the other day. I knew as soon as I heard the voices, and footsteps on the staircase. Urgent, but unsure… first came some gentlemen who’d I never met before. One was wearing the collar of a Reverend… the other a carefully trimmed mustache… but from behind came the multitude of sounds that herald the arrival of the police: Two way radio coms, mobile phones ringing, the heave and ho of the utility belts they all are burdened with- and the unmistakable quality of authority; they were here on business. Disturbed, curious, and a little frightened, I descended one flight to see what was what. They were trying to get into Jim’s apartment. They were pounding on his door, shouting his name… but there was no answer. Jim’s next door neighbors offered entry to the Police so that they might see from the fire escape into his home… perhaps he was sleeping, or hurt, and unable to move? There indeed was Jim- but he was silent, and motionless. The police were given permission to bring help, or to confirm what we all feared… After four very powerful kicks, the ancient redwood door and lock system gave way- and the officers could enter. Then two more officers arrived, as did the paramedics. The last were given first access, which made sense: Hopefully they could help. But it wasn’t long before they withdrew from Jim’s little studio. With drawn faces, they told the friends that they were very sorry to meet under such circumstances, and that they had bad news: Jimmy had died. The paramedics left, and then, of the four police officers present, also went two. The remaining officers explained that now, we wait for the Medical Examiner… During the off hours of business in this city, there is only one Medical Examiner team available for the whole of San Francisco.. so we waited… we sipped hot coffee, and chatted- all the while, aware of Jim. Thirty-five, to 40 minutes later they arrived. Like the other responders, their presence was guided by a very specific protocol. Questions to ask, photographs to take, and an index of pertinent personal items that would be removed, along with Jim’s remains… His friends were now there as much to honor Jim, as to complete the required ritual: Can you identify the body? Is that Jim? Next of kin? Medical records? Last Will, and Testament? When they, and the script were satisfied- the friends were kindly given leave to depart. They both looked stunned- not sure what to ask… who to notify? But the officials had answers for all the relevant questions. Of course they did… it’s their job… but for the civilians…for most of us, this is an entirely new, and unexpected ritual. Helping Jim, now meant helping the officials expedite his last journey. I am so proud to be friends with a bunch of amazing women (and men), who today are standing up for what’s right!!! The wonderful way you feel when you’re out on a lake… in a boat… and you can, at once, see and fear the angry wall in the distance, and can guess how soon you’ll meet. It’s not raining, then it’s a squall…and a one so loud that you cannot hear much else…so wet that nothing’s dry, so complete that the violence of the sails is mute. It doesn’t rain in San Francisco like that very often. I’m especially pleased to welcome it today. I’d really begun to mourn all the rainy, cold, wet winters that would never grace us in Northern California again… so wonderful to be wrong. Welcome, welcome!…OK… before you touch your instrument, I’d like to explain, and then discuss a few things with you. Let’s pause right here, and take a breath. Please take another breath, now pause. Your brain, your body, and your spirit are marvelous things… I’m still amazed at the potential for learning they have. Your mind, and body want to learn. They are in some ways like the best kind of dog. THEY WANT TO PLEASE YOU!!! As a matter of fact, they have already begun learning… they’ve been learning ever since you walked in the door to my studio. This is, again, a true marvel, but it’s also perilous… whatever you show your hands-mind-heart is what they will learn….so if you offer up the practice of fidgeting, your body will remember that, so next time, you won’t even need to ask it to fidget, it’ll begin all by its loneself… if you choose to fiddle with your instrument while I’m explaining, or demonstrating something to you, your body will learn that behavior also. It will almost come naturally. If you practice the part of a melody, or rhythm that comes easily, and put off a gentle, insistent pursuit of something not so easy, that’s what you’ll learn. See? So, having pointed all this out, and assuming that you’re paying reasonable attention right now, see how important it is to start your lessons, and practice with a clean slate? You’ll screw up (we screw up), you’ll not only have myriad things to learn, but also, volumes to unlearn. It’s been my experience that the unlearning is much harder, and tedious to abide, but it’s worth it! My teaching practice includes LOTS of talk about how to prepare for practice, how to listen, how to breathe and sit while practising, how to have fun, and how to keep at it. I haven’t seen many instructional vehicles where bad information is presented. You can find this good information most anywhere… and that can be the biggest challenge. So many choices… There are also a million different ways to present that good information. So I don’t offer much of that, for me, it’s not what you’re getting that’s interesting, as much as how you’re getting it. If you’re stubborn, inspired, and willing to fail, chances are really good that you’ve got what it takes to be some kind of a musician. Lots of that success will come from a sort of inherited familial, genetic gift. But that’s not as important as the stubborn bit. I know SO MANY people who have the whole package of “talent”, but they haven’t learned how to learn. They haven’t learned how to keep at it. It can come too easily, or one just can’t (or won’t) settle down with the minutiae of learning. It comes easily, (perhaps too easily) and we don’t take the time to consider what just happened. That’s a big chunk of a lesson. Let’s stop, take a few breaths, and end the lesson. OK? Advanced students might consider taking a breath before, and after finishing. There’s a gentle rain on the roof. The daily morning dose of radiated heat has been alloted, and now it’s quiet. No bubbling, no clanging, the system’s asleep. This weather front has brought the temperature back up to a tolerable degree. I’m comfortable in a bathrobe, and bare feet. I’m thinking about my loved ones. The coffee’s hot and dark with cream swirling, and my fingers are busy. In my dream I saw a once friend and co-worker- she was seated a few rows ahead of me. The theatre lights were very low, her face was in shadow, a reflection cast by the soft orange foot lights’ glow. Why she’s in my dreams I can’t imagine. She’s a person with whom I’d love to still be in contact- but not to be. Part of the new life I’m embracing is a life that accepts the other’s decision… if that’s expressed gently, shouted loudly, or only inferred through silence, my choice is acceptance. What a burden is guessing! What freedom to let go! I am fearful like never before about the future. The new administration (to me) represents everything that opposes a civil, just, and fair world. They’ve used some of the most base techniques available to sell their message. Intimidation, bullying, mocking, and lying, all are masked, or justified, behind a perceived higher calling: “We’re LOSING!”…”We don’t have time to be politically correct”…”Get over it!”…”Stop Whining!”, “Man up, Snowflake!”. In response, I’ve delivered insults calculated to shut the offending party up forever… to slay them dead in a duel of words…or more simply, I’ve tried to emulate my foe. I’ve heard enough, and I’ve said enough. Actually, I’ve heard variations of the same message since I was a child. The ends justify the means. Sadly, I’ve concluded that this is entirely untrue. Every decision a person makes, every moment, every day has a consequence. I’m insulted, and I insult. I’m scared, so I scare… It never ends… I used to know lots of people whose political affiliation was some where, and so far away from my own that it was a miracle we could communicate at all. Before the advent of social media, if someone was insulting, ugly, or just plain rude, we could choose to work it out, or just part ways. Now, instead of that, the feud can grow and grow like a wild fire, dragging bystanders into the fray…or oddly, if a person offends my kingdom, I can banish them for eternity with a single “block”, and avoid any further contact. But to get along, we need to find common ground, and that takes some effort. With musicians, it’s amazing to me how quickly we can come to blows over a difference, yet both be delighted at Mother Maybelle Carter’s guitar playing. Today, I’d rather be happy than be right. Offending someone, somewhere, will not, nor could not improve our relations. Yet, from my “side” of the political divide there are endless grotesque drawings, televised shamings, and broadcasted embarrassments directed at not only representatives of that new administration, but by implication, at those who voted for them. The internet was new to me when the Obama administration was sworn in. I couldn’t believe the things that folks posted on their social media page, what was being written by journalists in the news-medium, and by what I’d hear on the radio, or television. None of this helps… and, of course, it was exhilarating. The little doubt that nags as I hit the “post” button, to retaliate, is shoved aside by the delight in shutting down the adversary. Therefore, as an alternative to crawling in the muck, I’m going to propose a solution. Get involved! Start at the local level: Run for office, organize a union, volunteer at Planned Parenthood, or the A.C.L.U.. Give money to a cause that you root for…and stop getting dirty as if that was your only choice. My Grandmother Isis used to tell me “if you don’t have anything nice to say, then don’t say anything at all.” If we don’t know how to get along with folks, find folks who do, and ask them how they do it. Consider places in the world, throughout history, where civility has been abandoned, and see where it got them. The rage that comes from fear, the alienation that comes from being on the right side are powerful, and attractive incentives that would have us surrender to our base-most instincts. Are these helping anyone right now? I’ve been talking since I was a baby. Writing came very late. Seeing my words on a page, everyone or anyone seeing my words was very uncomfortable. So I spoke, or sang, I played the guitar, I played the banjo, and that was enough. In 2008 I bought my very first computer…and descended into the world of social media and letters to the editor; it was my turn to have my say in writing. I enjoyed it. I became very fussy about how I’d “publish” my thoughts. Wherever possible, I used the edit option because I didn’t want to look stupid or ignorant, or worse, to be misunderstood. Many of the comments I read were very hard to follow because the writing was sloppy, misspelled, or just incomplete… people were writing the way they talk (though the talk was mostly arguing), and it didn’t necessarily reflect the amount of education they’d achieved. That wasn’t appealing. My profile tells you that I’m a musician, an indoor gardener, and a photographer…I’m pretty good at some of these, and, I think, very good at music. I love to play, and teach music. My voice teacher in college explained that until he’d begun teaching, he’d really held an incomplete understanding of singing. That’s been my own experience, especially so with music. Perhaps through my writing, I’ll help you learn how to learn.